“With 284 pictures between the book’s 533 pages, the book depends equally on its pictures as it does on the actual words. Selznick himself has described the book as “not exactly a novel, not quite a picture book, not really a graphic novel, or a flip book or a movie, but a combination of all these things.” The Caldecott Medal is for picture books, in 2008 this was first novel to receive. The primary inspiration is the true story of turn-of-the-century French pioneer filmmaker Georges Méliès, his surviving films, and his collection of mechanical, wind-up figures called automata. Selznick decided to add automata to the storyline after reading Edison’s Eve by Gaby Wood, which tells the story of Edison’s attempt to create a talking wind-up doll. Méliès actually had a set of automata, which were either sold or lost. At the end of his life Méliès was broke, even as his films were screening widely in the United States. He did work in a toy booth in a Paris railway station, hence the setting. Selznick drew Méliès’s real door in the book.” Summary from Goodreads. This book is really special. It’s a magical story told in such a unique way and it was such a pleasure to read. 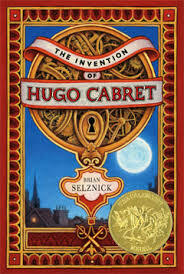 The Invention of Hugo Cabret tells the story of Hugo, a young boy trying to fix a automaton that his deceased father found in a museum. Although Hugo is a hefty book, its such a quick read mainly because it is half told in pictures. This was hard for me to get used to at the start but I found myself blown away by the beauty of the drawings and I also loved the seamless way the action transferred from words to pictures. I adored the setting, it was well researched and Paris was beautifully portrayed in both pictures and words and the time period is one of my favourites. I thought the whole premise of Hugo living in the train station and keeping the clocks on time was SO cool, and I was really scared for him with the various unsympathetic adults around. Hugo was a really interesting character. He was not instantly likeable and most definitely had a hard exterior. I actually really liked this about him – I thought his secretive personality reflected his tough life. Another great character was Papa George, who was mysterious from the start. I really enjoyed the gentle peeling back of his character and past – it made the mystery more engaging and entertaining. Isabelle and Hugo’s relationship was developed really nicely and as always, I love a character who loves books! The book, in essence, is a love letter to films. I loved the inclusion of the photographs and the history of filmmaking (it made me want to find out more!). However, I think the thing that makes this book special is the fact that the pictures, however beautiful they are, do not detract but rather add to the story. It isn’t a gimmick, as I hoped it wasn’t and the story is deep and beautiful and not linear or one dimensional. Overall, I adored this book, it was great. So, as soon as I finished the book I ordered the movie. It looked beautiful, it had great reviews and was directed by Martin Scorsese. 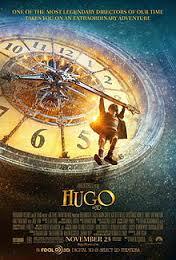 Hugo was released in 2011 and stars Asa Butterfield and Chloe Moretz. I would say its a pretty accurate adaption of the book, with some small differences. I thought Asa Butterfield absolutely stole the show as Hugo. He really got the emotion and struggles of the character. Chloe Moretz was also great – her accent was spot on. They did change the personalities of the characters slightly – Hugo was much less reserved then in the book and his and Isabelle’s relationship went much smoother. I prefer Hugo in the book, but I did like the back story given to the Station Master – it humanized him. The movie was beautifully shot, it was visually stunning and I thought this mirrored the books aesthetic. You could really sense Martin Scorsese’s passion for film history and I thought this shone through and really made the film really great. Hugo is thoroughly deserving of its amazing reviews and awards. My only criticism would be that the pace may be a little too slow for children, however generally the film was action packed and interesting from start to finish. It was beautifully acted, the visuals were stunning and the essence of the story was captured beautifully. This is a film I will watch again and again. I love your review Laura! It’s impossible for me to review Hugo because I love it too much 😀 My favourite parts of the movie are the visuals and the music. The filming is flawless and I watch it at least once a year. Thank you! The movie blew me away – I am normally wary of book adaptations but Hugo was just fantastic! And the book is a masterpiece!